Home / Shop Online / Decor / Vieux Paris Porcelain Victorian Rococo Gilt Orchid Vase Jacob Petit? 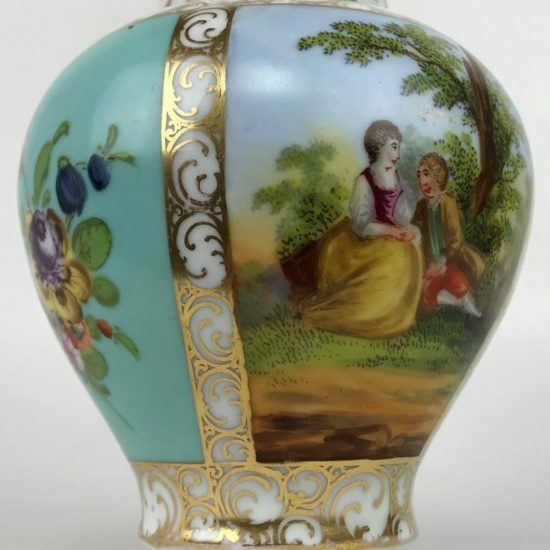 Today we are thrilled to be offering for sale a fabulous antique 19th century Old Paris Porcelain Victorian Rococo porcelain vase! This grand and ornate parlor vase is intricately and expertly crafted and detailed. 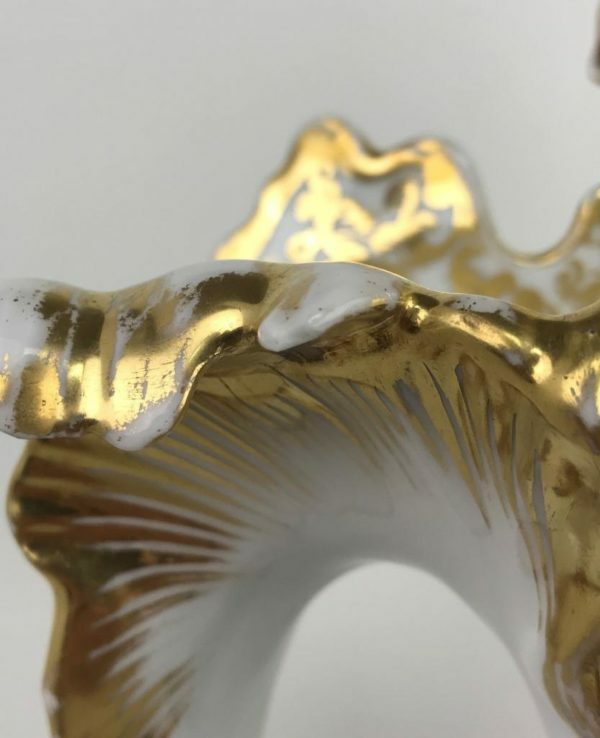 The vase features an exuberant and lavish sculptural, three-dimensional body. The flared rocaille-style top features a draped front orchid flowers, and the rim morphs down either side of the vase to form the sculptural floral handles. The handles features extensive applied floral decoration modeled after the Dactylorhiza fuchsii blue spotted Orchid. The vase is vividly polychromed with vibrant colors and bright gilding. 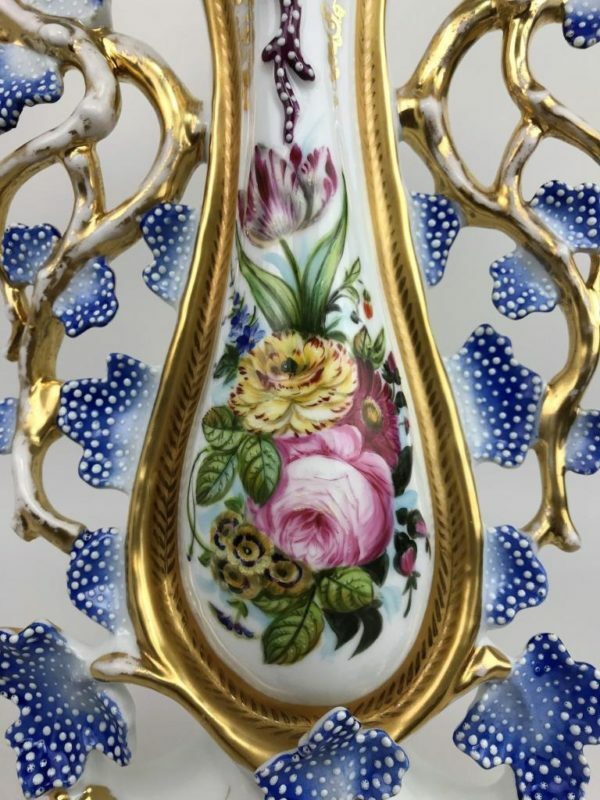 The body of the vase features a beautiful hand-painted floral scene, along with cascading gilded arabesque designs. The interior and back of the vase feature gilded arabesque detailing as well. 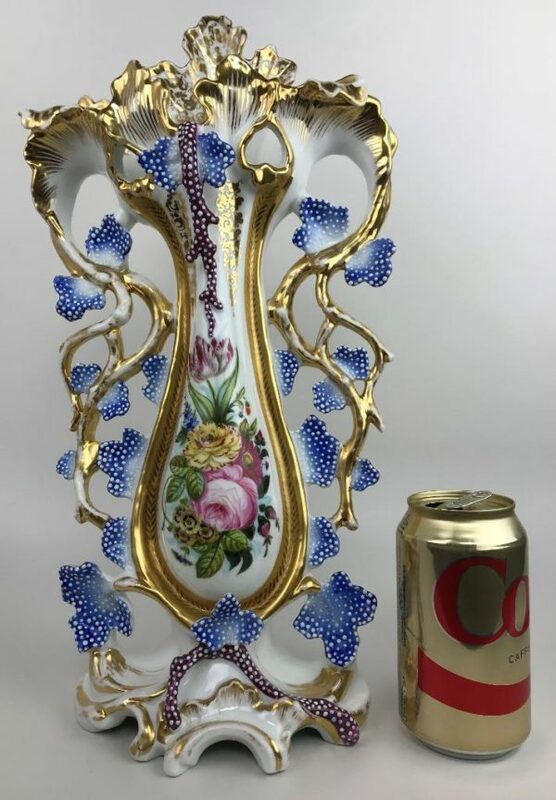 The vase is unmarked but for a letter “J” on the bottom, which leads us to be believe this wonderful piece is the work of famous Paris porcelain maker and decorator Jacob Petit; the vase has all the hallmarks and quality of the fine work of Jacob Petit. Petit worked at the porcelain factory at Sèvres as a painter. With his brother Mardochée he bought a porcelain factory in Fontainebleau in 1830, finally settling in Paris in 1863. The wares he made were of a purely ornamental character; e.g., vases, statuettes, clocks. 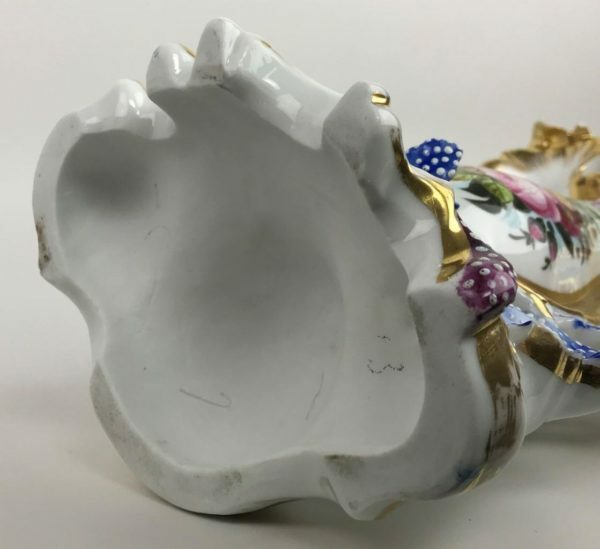 The high-quality porcelain may have been fired in Limoges. The shapes are idiosyncratic interpretations of the 18th-century rocaille style typical of the popular preference for the neo-Rococo during Louis-Philippe’s reign (1830–48). The vase presents beautifully and is in very good antique condition, with very minor wear and patina commensurate with age. There is minor loss to gilding. 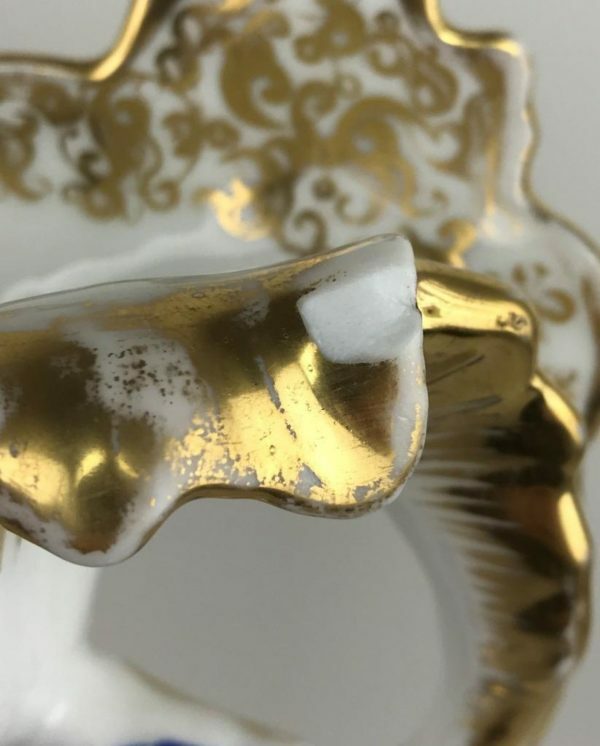 There is a stable manufacturing flaw/fissure inside the front lip of the vase; there are two small (and very hard to notice) chips along the flared front rim of the vase (please see last photos). 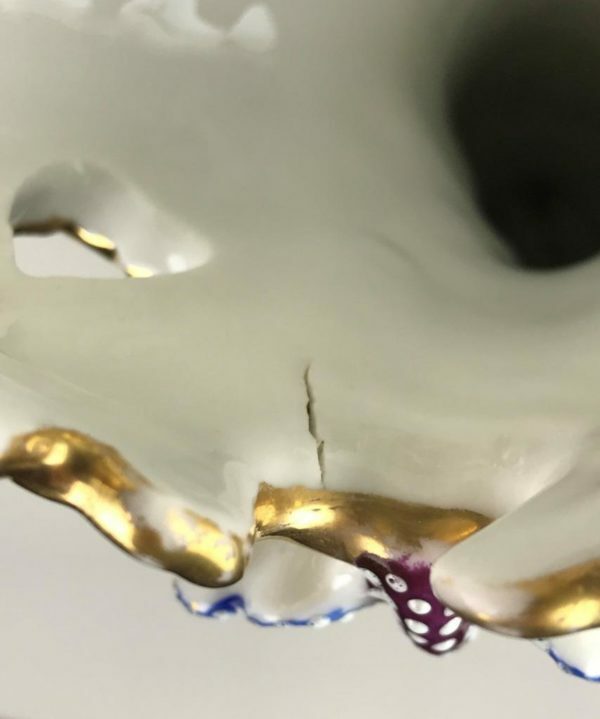 Easily repaired but we doubt you’ll bother – virtually unfindable. 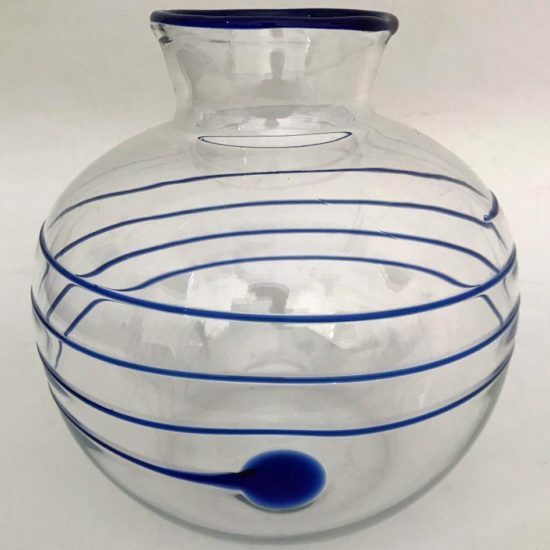 Add old world elegance and grandeur to any interior with this masterpiece vase! 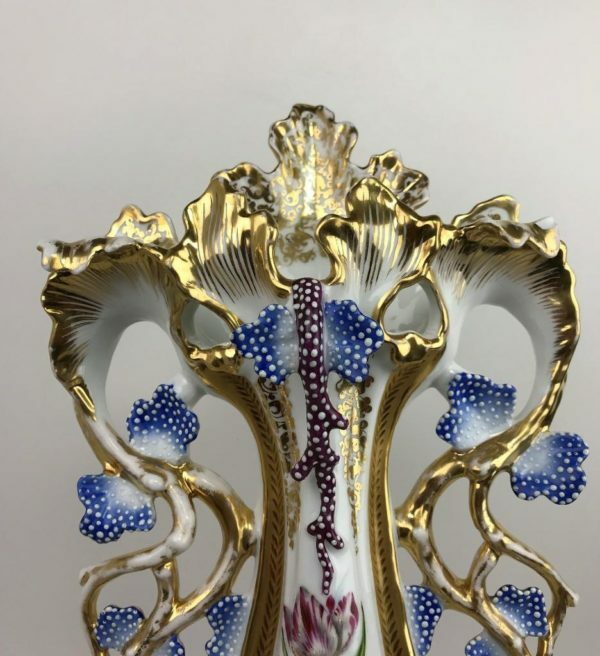 This fabulous piece will make a crowning addition to any fine antique porcelain collection… Fresh to the market!